The San Diego Association of Governments admitted Friday it would not finish building everything it promised in 2004, when voters extended a sales tax to pay for highway and transit projects across the county. SANDAG had for years insisted it would still build everything in TransNet, the tax-funded program that promised major projects like the Mid-Coast Trolley extension and an expansion of I-15, even as its revenue expectations consistently fell and its cost projections relentlessly grew. Voice of San Diego first reported the agency’s infrastructure program was in financial turmoil in October 2016, but SANDAG regularly maintained that concerns were unwarranted. That’s over now. 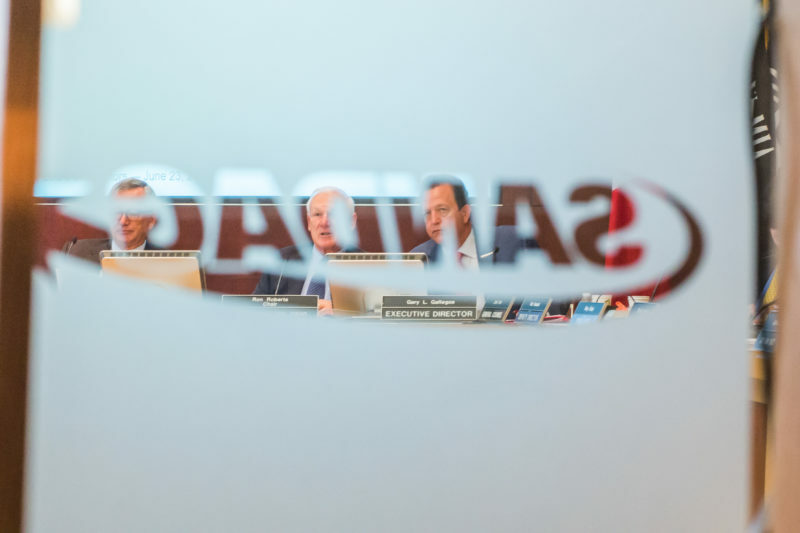 SANDAG’s new executive director, Hasan Ikhrata, told the board Friday that it was time to start deciding which remaining projects would get the dwindling share of expected funding, and which would be eliminated. Then, moments later, the board of elected officials from around the county voted to start from scratch with its long-term transportation plan, after Ikhrata told them two weeks ago that there was no way to meet state requirements for greenhouse gas reduction with anything resembling the region’s current transit and highway network. 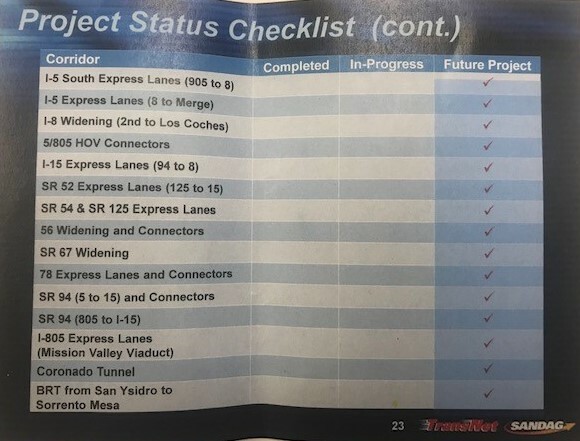 SANDAG is now in danger of falling out of compliance with state and federal requirements that the region have an up-to-date transportation plan, putting potential state and federal funding in jeopardy in the meantime. That would further exacerbate its funding woes. Assemblywoman Lorena Gonzalez has agreed to carry legislation in Sacramento that would clean up the agency’s legal problems from not adopting a new plan, Ikhrata said Friday. He acknowledged that the approach would mitigate SANDAG’s risks of losing even more funding, but it wouldn’t eliminate them. Ikhrata had signaled a few times since taking the job that it was time to come to grips with the fact that TransNet was out of money. Now it’s official. Many on the board thanked him for his candidness and welcomed the new approach from the agency. Steve Vaus, the mayor of Poway and SANDAG’s board chair, was even more succinct. “The good news is the public is getting the unvarnished truth, and I think that’s an indicator of a new day at SANDAG,” he said. More than a year ago, Coronado Mayor Richard Bailey, a relatively new board member, identified the quirk in SANDAG’s argument that it would still be able to build everything it promised in TransNet, the 2004 ballot measure. Every year that the agency’s tax collections came in short of expectations, and its cost expenditures surpassed them, SANDAG did something simple. It took the widening gap between what it was expected to collect and what it was expected to spend, and simply projected that the state and federal governments would come through with that much money. It was not so much a projection of what funding they could reasonably get as it was a simple deduction of what they needed to get, which they called a projection. “If we’re building our budgets based on the dollars that are needed, versus the dollars we actually expect to receive, then we need to fundamentally change how we build our budgets,” Bailey said during a 2017 board meeting. At the time, SANDAG said it needed $18.1 billion from state and federal sources to finish TransNet. That was up from $17.5 billion a few months earlier, and $10.5 billion in 2015. Even though the agency needed nearly twice the out-of-town revenue that it “projected” it would win just three years earlier, staff simply declared that the new need was likely to come in. The gap between revenue and cost expectations has now widened to $22.1 billion. Finally, SANDAG staff has seen a number that it was not willing to call a reasonable expectation. On the 2004 ballot, the agency said it would bring in $1 from out of town for every $1 it collected locally. Historically, SANDAG has done better than that, bringing in $3 from out of town for every $1 it raises locally. But as SANDAG’s financial problems have mounted, its need for outside money has surpassed not only what it committed to on the ballot, but its historic performance as well. Back in 2016, it needed to bring in $3.41 for every $1 it collected locally – and the agency insisted it would be able to do that. That number has steadily grown, and Friday SANDAG acknowledged it now needs to bring in $4.21 from the state or feds for every $1 it gets from sales taxes. If the agency hit its historic average, it would need to cut $9.8 billion in projects from the TransNet program. The list of options begins with the projects that haven’t broken ground yet. SANDAG staff presented a list of those that are now competing for the little bit of funding that remains. There are other projects that have technically begun, but that could also be scaled back. For instance, SANDAG finished building the Sprinter, a light-rail line in North County, but it was initially proposed as a line with two sets of tracks, allowing trains to run more frequently. Completing the second set of tracks could be history. The list of looming project cuts has one clear feature already: Almost all of the unbuilt projects are freeway improvements, not transit. That will enflame conservatives and rural or North County officials who want the agency to spend more resources on the projects that benefit their residents, who are not the urban-dwellers who most benefit from transit upgrades. But the tilt toward unbuilt highways also settles a fight from back in 2016, when SANDAG put the ultimately unsuccessful Measure A on the ballot to fund more transportation projects. It is clear now the new revenue from Measure A would have gone toward paying down the old TransNet promises the agency now acknowledges it cannot afford. That means the split between highway and transit funding on Measure A was skewed. The actual spending would have tilted more toward highways as the agency used the new money to fulfill old promises, and the new promises became the unfunded ones. After SANDAG’s board learned that it would not finish TransNet, and part of its job in the coming years would be to decide which projects its constituents had been promised would never be built, it went ahead and decided to start from scratch on a new vision for regional transportation. The agency’s staff had surprised the board two weeks ago with the announcement that this was necessary. On Friday, the board discussed its options, accepted that this was its best one and voted unanimously to go along with it. Ikhrata said he had approached Gonzalez to put up a spot bill in the Legislature, a placeholder that can be replaced with the substantive changes necessary after the deadline to introduce new legislation has passed, that would essentially clear SANDAG from the requirement that it pass a new transportation plan by the end of this year. That would help mitigate the potential lost funding the agency could experience as it takes up to two years writing up a new 40-year plan. But between the need to reprioritize existing TransNet projects with a dwindling budget, and the need to write a new big-picture vision, there will be increased pressure on the splits along which San Diego’s transportation debates have historically occurred: transit or highways, rural or urban, north or south or east. Ikhrata, since taking over, has pledged to end that binary thinking. It’s essential to craft a vision that works for the entire region, without pitting modes against each other, he’s argued. 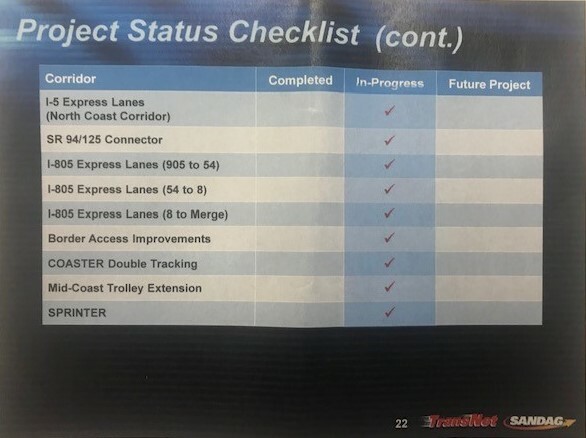 But County Supervisor Kristin Gaspar in her Friday comments on the TransNet news outlined how she would prioritize remaining projects. She asked staff to prepare information on when each project was first presented to the board, when the board committed to build it and when they were supposed to be finished. “I know my North County constituents will be very disappointed,” she said. County Supervisor Jim Desmond, likewise, emphasized that transit would not be a suitable option for people in Valley Center or Alpine or for the agriculture industry as a whole. Public speakers from a litany of environmental organizations and progressive officials, meanwhile, praised SANDAG’s new world as an opportunity to embrace a vision for San Diego that the region had resisted for too long. Carlsbad Councilwoman Cori Schumacher said she was proud to be sitting on the board when it finally got serious about creating a transit system like the kind one experiences traveling abroad. Gomez said it was important to remember that delaying the plan was necessary because “rearranging the seats” on the existing plan wasn’t sufficient to deal with the region’s climate emissions. Chula Vista Mayor Mary Salas said she was glad the region was admitting that it hadn’t done enough, no matter how it might see itself. Mayor Kevin Faulconer said the reports to the board were the most important SANDAG had seen in years. “These are the difficult decisions that weren’t happening here in the past,” he said. SANDAG’s board walked away with a clear understanding that it didn’t have enough money to make good on its past promises, and that a system that looks like the one in place today wasn’t good enough to meet state climate requirements. But it’s less clear that there’s any consensus on how to proceed. Ikhrata asked that the board give the region an opportunity to design the sort of transportation system it deserves, and that can easily reduce emissions beyond state mandates, without regard for how much it costs. That will come later, he said.